Tripp Lite's PRO550X line-interactive UPS offers protection for PCs, workstations and other sensitive electronics in an attractive, ultra-compact housing. Prevents data loss and system downtime by providing battery-supported AC output during blackout conditions. Built-in Automatic Voltage Regulation (AVR) maintains 230V nominal output during brownouts as low as 160V and overvoltages to 280V. 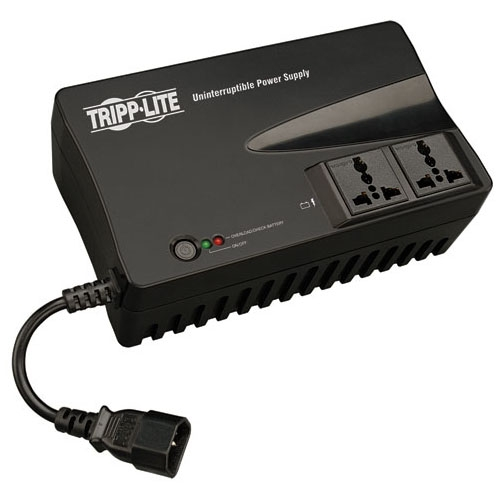 2 universal output receptacles with full battery support and surge suppression protect computers, monitors and other vital system components from loss of power. Audible alarm and front panel LEDs offer status information. 550VA/275W power-handling ability supports entry-level PCs for up to 13 minutes during power failures.